– A video guide of how to carry a child on a bike (the guardian). – An online service that lets you rent a bike anywhere in the country (Wired). – Divvy’s bike share program in Chicago is another successful bike share program (ABC). 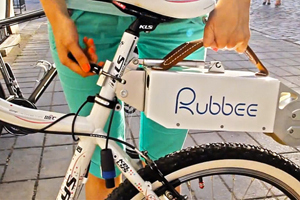 – An entire new way of electric-assist bike by Rubbee (DVICE). – 10 best cities around the world if you love biking (glading). – Ghost Bike is used to protest for cycle safety (BBC). – Peninsula Bike Party this Friday. – SF Critical Mass, also this Friday. – Sunday Streets in the Mission this Sunday.